What is the common cold? What causes the common cold? Where can people find more information about the common cold? The common cold is transmitted by virus-infected airborne droplets or by direct contact with infected secretions. Being in cold weather does not cause the common cold, but cold weather promotes close contact. First and foremost, consider whether you are putting yourself or others at risk if you go to work. You're putting others at risk if you or your children have a contagious illness (more on that later). You're putting yourself at risk if the symptoms of your condition, or the side effects of medication, could cause you to have an accident on the job, injure others, or produce devastating mistakes in your work product. Putting anyone in harm's way is a clear reason to stay home. The common cold is a self-limited contagious disease that can be caused by a number of different types of viruses. The common cold is medically referred to as a viral upper respiratory tract infection. Symptoms of the common cold may include cough, sore throat, low-grade fever, nasal congestion, runny nose, and sneezing. 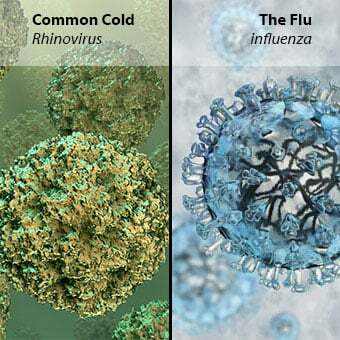 More than 200 different types of viruses are known to cause the common cold, with rhinovirus causing approximately 30%-40% of all adult colds. Rhinovirus multiplies best at temperatures found in the nose. Rhinovirus infection rates peak from September to November and March to May. Nevertheless, rhinovirus may cause disease at any time of year. During peak periods, up to 80% of colds may be due to rhinovirus. Other commonly implicated viruses include coronavirus, adenovirus, respiratory syncytial virus, and parainfluenza virus. Because so many different viruses can cause the common cold, and because new cold viruses constantly develop, the body never builds up resistance against all of them. For this reason, colds are a frequent and recurring problem. In fact, children in preschool and elementary school can have six to 12 colds per year while adolescents and adults typically have two to four colds per year. The common cold occurs most frequently during the fall, winter, and spring. The common cold is the most frequently occurring viral infection in the world, and it is a leading cause of doctor visits and missed days from school and work. It is estimated that individuals in the United States suffer an estimated 1 billion colds per year, with approximately 22 million days of school absences recorded annually. In the United States, the common cold is thought to account for approximately 75-100 million physician visits annually, with an economic impact of greater than $20 billion per year due to cold-related work loss. 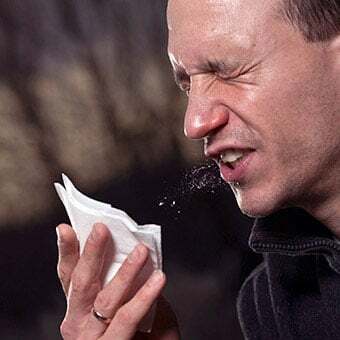 The common cold is spread either by direct contact with infected secretions from contaminated surfaces or by inhaling the airborne virus after individuals sneeze or cough. 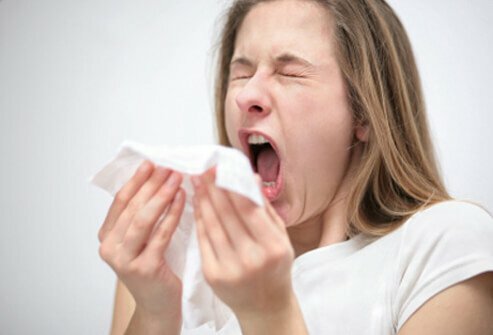 Person-to-person transmission often occurs when an individual who has a cold blows or touches their nose and then touches someone or something else. A healthy individual who then makes direct contact with these secretions can subsequently become infected, often after their contaminated hands contact their own eyes, nose, or mouth. A cold virus can live on frequently touched objects such as doorknobs, pens, books, cell phones, computer keyboards, and coffee cups for several hours and can thus be acquired from contact with these objects. In general, the common cold can be contagious anywhere from one to two days before the symptoms begin up until the symptoms have completely resolved. However, the common cold is typically most contagious during the initial two to three days of illness. The signs and symptoms of the common cold in infants and children are similar to those seen in adults. The cold may begin with a runny nose with clear nasal discharge, which later may become yellowish or greenish in color. Infants and children may also become fussy and have decreased appetite. Though the common cold usually occurs in the winter months, the cold weather itself does not cause the common cold. Rather, it is thought that during cold-weather months, people spend more time indoors near each other, thus facilitating the spread of the virus. For this same reason, children in day care and school are particularly prone to acquiring the common cold. The low humidity during these colder months is also felt to contribute to the increased prevalence of the common cold, as many of the implicated viruses seem to survive better in low-humidity conditions. 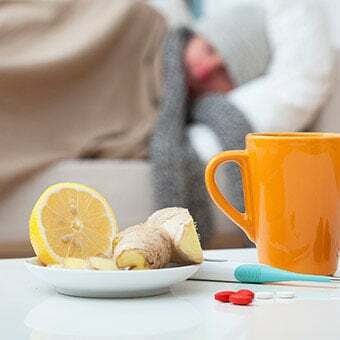 Most colds will resolve after seven to 10 days, though some individuals experience a shorter course and others a more prolonged illness, again depending on the particular virus involved, as well as the infected person's underlying health issues. Many people confuse the common cold with influenza (the flu). Flu is caused by the influenza virus, while the common cold generally is not. 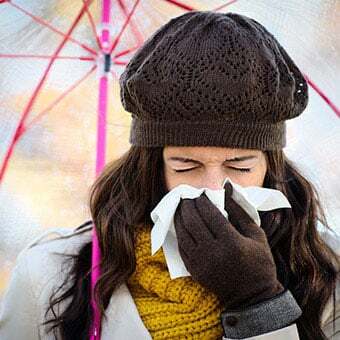 While some of the symptoms of the common cold and flu may be similar, patients with the common cold typically have a milder illness than patients with the flu. Patients with the flu usually appear more ill and have a more abrupt onset of illness with fever, chills, headache, substantial muscle and body aches, dry cough, and extreme weakness. There is laboratory testing available to confirm the diagnoses of influenza, but health care professionals make a diagnosis of flu primarily based on classic flu symptoms rather than laboratory tests. A general practitioner most often diagnoses and treats the common cold, in addition to family medicine physicians, internists, and pediatricians. If you visit an emergency department, an emergency medicine physician will likely treat you. An infectious disease specialist may consult hospitalized individuals with very weakened immune systems, such as those who have had an organ or bone marrow transplant or have had recent chemotherapy for cancer. There is no cure for the common cold. The common cold is a self-limiting illness that will resolve spontaneously with time and expectant management. Home remedies and medical treatments are directed at alleviating the symptoms associated with the common cold while the body fights off the infection. Home treatment for upper respiratory infections includes getting rest and drinking plenty of fluids. In older children and adults, common over-the-counter drugs such as throat lozenges, throat sprays, cough drops, and cough syrups may help relieve symptoms, though they will not prevent or shorten the duration of the common cold. Gargling with warm saltwater may help people with sore throats. Decongestant drugs such as pseudoephedrine (Sudafed) or antihistamines may be used for nasal symptoms, while saline nasal sprays may also be beneficial. It is important to note that over-the-counter medications may cause undesirable side effects, therefore they must be taken with care and as directed. Pregnant women should discuss the safety of common over-the-counter medications with their pharmacist or health care professional. Acetaminophen (Tylenol and others) and non-steroidal anti-inflammatory drugs such as ibuprofen (Advil, Motrin) are common over-the-counter medicines that can help with fever, sore throat, headache, and body aches. The treatment for infants and small children with the common cold is supportive as well. It is especially important to allow rest and encourage plenty of fluids in order to prevent dehydration. Nasal drops and bulb suctioning may be used to clear nasal mucus from the nasal passages in infants. Medicines such as acetaminophen and ibuprofen may be taken for pain or fever based on the package recommendations for age and weight. Do not use aspirin or aspirin-containing medications in children or teenagers because it has been associated with a rare, potentially fatal condition called Reye's syndrome. Finally, over-the-counter cough and cold medications for infants and young children are not recommended. Medication manufacturers now recommend that over-the-counter cough and cold drugs not be used in children younger than 4 years of age because of serious and potentially life-threatening side effects. 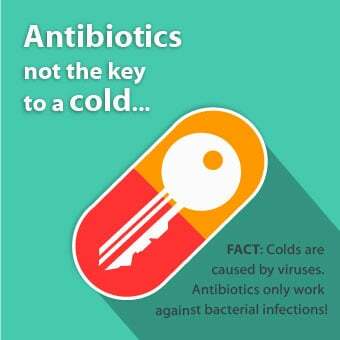 Occasionally, a bacterial infection such as sinusitis or a middle ear infection (acute otitis media) can develop following the common cold, however, the decision to treat with antibiotics should be determined by a doctor or health care professional after a medical evaluation. About 30% of children with middle ear infections have rhinovirus. Because middle ear infection may be viral, some experts suggest treating acute otitis media in children with non-steroidal anti-inflammatory drugs and resorting to antibiotics only if there is worsening or no improvement. In general, the common cold can be treated at home and managed with over-the-counter medications. However, if more severe symptoms develop, such as shaking chills, high fever (greater than 102 F), severe headache, neck stiffness, vomiting, abdominal pain, difficulty breathing, chest pain, confusion, or failure to improve after 10 days, consult a health care professional immediately. Infants 3 months of age or younger who develop a cold or fever should consult a health care professional as well. Complications that may arise from the common cold include the development of a bacterial middle ear infection (otitis media) or bacterial sinusitis. In individuals with asthma or chronic obstructive pulmonary disease (COPD), the common cold can sometimes trigger an exacerbation of their illness, leading to shortness of breath and increased wheezing. Though uncommon, pneumonia can sometimes develop as a secondary infection in individuals with the common cold. For example, coronaviruses, rhinoviruses, and several other cold-causing viruses can cause bronchitis and pneumonia in people with very weakened immune systems. Get an evaluation by a health care professional for any of these suspected complications. Frequent and thorough hand washing during flu and cold season is extremely important, as this can destroy viruses acquired from touching contaminated surfaces. In between using soap and water when hands are visibly dirty, use an alcohol-based hand sanitizer containing at least 60% alcohol. Disinfect frequently touched surfaces or personal objects with a product that is effective against flu and cold-causing viruses (and safe for the type of surface). Do not share personal belongings such as towels, handkerchiefs, or tissues. Avoid sharing utensils and try to use disposable items (such as disposable cups) if someone in the family has a cold. Encourage individuals to cover their nose and mouth when coughing or sneezing to prevent transmission of the virus. A sneeze can spray a fine mist of contagious droplets up to 6 feet. Lifestyle modifications such as smoking cessation and stress management may decrease susceptibility to acquiring the common cold. If the air in the home is very dry during the winter, a cool-mist humidifier or vaporizer may be helpful. Turner, Ronald B. "Rhinovirus: More than Just a Common Cold Virus." The Journal of Infectious Diseases 195.6 Mar. 15, 2007: 765-766. https://doi.org/10.1086/511829. United States. Centers for Disease Control and Prevention (CDC). "Common Cold and Runny Nose." Sept. 26, 2017. <https://www.cdc.gov/antibiotic-use/community/for-patients/common-illnesses/colds.html>. United States. Centers for Disease Control and Prevention (CDC). "Common Colds: Protect Yourself and Others." Feb. 12, 2018. <https://www.cdc.gov/features/rhinoviruses/>.